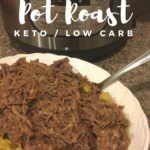 This Keto Instant Pot Pot Roast Recipe is seriously one of the best recipes ever! So easy to make and full of flavor, it will be a hit with the entire family! I’ve seen this recipe many times, but once I tried it finally, I was hooked. I love to find ways to make it easier to cook for my family. Busy days with 4 kids, homeschooling, and blogging that time gets away from me very quickly. This week has been particularly busy, so I thought I’d try making a pot roast in the Instant Pot tonight for dinner. 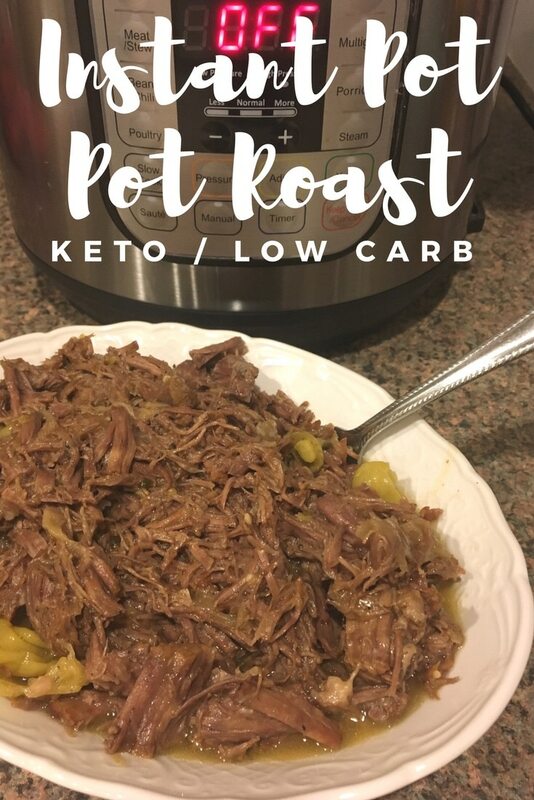 I was absolutely blown away with how amazing this Instant Pot pot roast recipe was when it was done. The flavor is far better than slow cooking all day in a crockpot. I don’t even know how to explain in words except to say that it seems like the flavor is infused in the meat. It is beyond fork tender. I know that not everyone seers the meat first, but I always have and appreciated the fact that I was able to do everything in one pot. This is basically the same recipe as my Keto Pot Roast for the Crock Pot but altered for the Instant Pot. Press the Saute button on the Instant Pot and allow it to get hot. Add olive oil then sear pot roast on all sides. Remove roast from Instant Pot and use the beef broth to deglaze the pan by stirring with a wooden spoon. Transfer beef roast to Instant Pot and add all other ingredients except for the Xanthan Gum and bring to a boil. Press manual high pressure and use the up bottom to program 90 minutes. It will take several minutes for the Instant Pot to come to pressure. When it does, it will begin to count down from 90 minutes. Once the time is complete, let it naturally release for 15 minutes then quick release. Once the pin has dropped remove the lid and use a fork to shred. Turn Instant Pot to warm and sprinkle 1/2 teaspoon of Xanthan Gum to thicken the gravy. Allow the roast to sit for 10 minutes or until the gravy has thickened before serve. 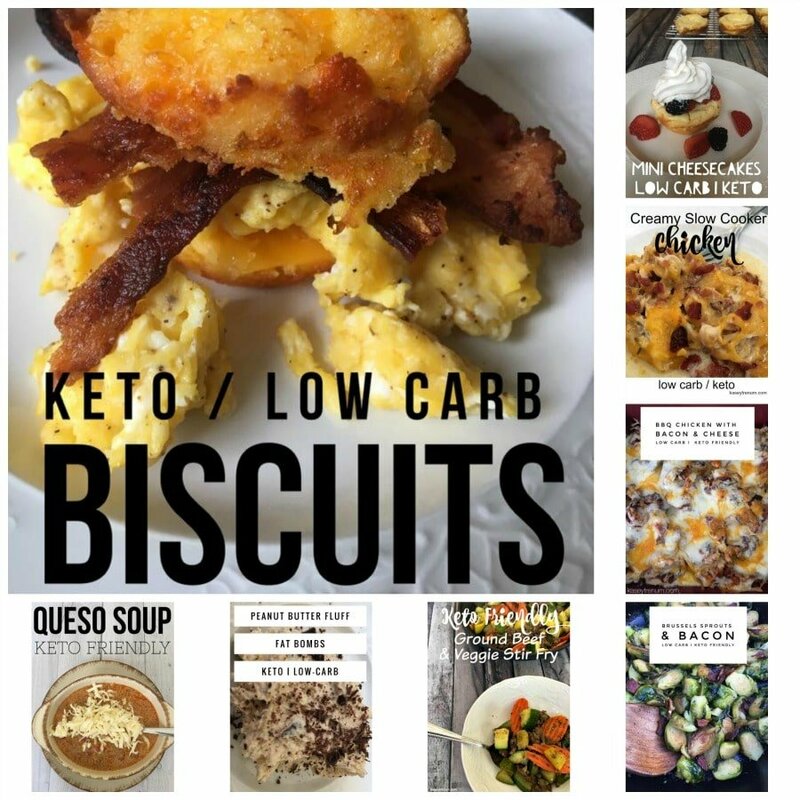 If you aren’t already following my Easy Keto/Low Carb Recipe Page on Facebook where I post all my new recipes, you can join here and follow me on Pinterest here. You’ll also want to check out all of my Keto/Low Carb Recipes in my Keto/Low Carb Recipe Index. I love finding great meals my family loves that are also keto friendly, so you’ll find some of our absolute favorites below! This meal came out amazing. The gravy made at the end really sets it apart. You would have to put in an app and figure out yourself as it will be based on the cut of meat you personally choose and so much of the fat from the butter is in the gravy making it really hard to get exact macros. If my roast is smaller would I cook it for less time? It would depend how much smaller but I’ve only tested this recipe with the size indicated so I can’t say for sure.